There has been some discussion about gold - capital adequacy ratios lately. What is a capital adequacy ratio (CAR)? Capital adequacy ratio is the ratio which decides the ability of a bank to meet its liabilities in the agreed upon time frame. This includes not going past the agreed time limit to repay debts as well as other risks such as credit risk, operational risk, and so forth. This is the capital the bank uses as a cushion against any potential losses it might incur. 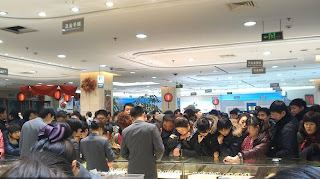 It is designed to protect the bank's depositors and other lenders. Most nations define what the CAR is going to be and maintain the ir banks CAR in order to maintain confidence in the countries banking system. Australia is a notable example of this where the current labor government, in the early stages of the GFC, instituted a guarantee for depositors of Australia Banks to ensure the depositors would not lose any funds in the event of a banking crisis. This is expressed in the form of Tiers. Currently gold is a Tier 3 with a 50% risk weighting as it does today. However The Basel Committee for Bank Supervision (or BCBS) are meeting shortly to decide if gold should be made a Tier 1 asset for commercial banks with a 100 percent weighing instead of the existing Tier 3 with just 50 percent weighing. Together with the possibility of increasing the amount of capital banks must set aside this is a superb validating of gold’s ranking as an asset value. This might be the reason the IMF is selling gold to central banks who are quietly buying up gold, many through intermediaries, all over the globe. Also may be why NuWire investor along with Bill Gates, Buffet and others are dumming down the price of gold. Governments and Banks don’t want to pay too much for their gold. Not without reason it seems. If Gold is included in Tier 1 of the Capital Adequacy Ratios this will increase its perception of value many times and that will contribute to a higher price of gold. 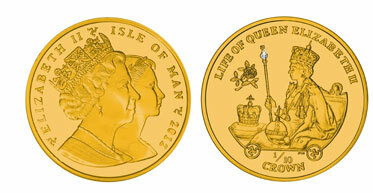 To celebrate a remarkable 60 years of Queen Elizabeth II as Monarch, the Isle of Man Government has approved the release of gold and silver coins to celebrate the Diamond Jubilee. This year we commemorate the Diamond Jubilee of the Accession of Her Majesty Queen Elizabeth II. Her Majesty became Queen and Head of the Commonwealth in 1952 and was crowned in Westminster Abbey in June 1953. The Queen is only the second Monarch in British History after Queen Victoria to achieve a Diamond Jubilee making this an extremely rare event. This remarkable coin features the Royal Cypher, including St Edward’s Crown, which crowned Queen Elizabeth the second at the Coronation. 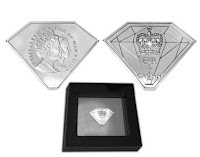 A genuine diamond has been inset into each coin. Which is then presented in a ‘window’ box and available in Fine Silver 1/2oz and Fine Gold 1/10oz. The second coin, a Fine Gold 1/10oz coin, features an image of Her Majesty at her Coronation shown with the Crown Jewels, including the Royal Sceptre and Orb. This beautiful coin also has a genuine diamond inset into it. Both coins portray a unique double effigy produced especially for this year and showing a portrait of Her Majesty as she appears on current coins alongside a portrait as she appeared on the coins at the start of her Reign. Pobjoy produces many fine gold and silver coins on behalf of various nations and governments. "The Pobjoy family has been associated with fine metalwork since the Middle Ages. The Company was recently granted permission to use the family Coat of Arms in which the Medieval Popinjay is the central motif. The Popinjay was a painted wooden parrot used in archery contests in the 14th century and the name Pobjoy is derived from this. The Latin motto 'OCULO CERTO' means 'with an unerring eye' and applies equally to the ancestor's prowess as a marksman, as to the Company's reputation for the high quality and precision of its products. Over the past three centuries, the Company has been involved in many diverse fields, but they have always been involved in metal, both base and precious. During World War II Pobjoy Aero Engineering was involved in the manufacturing of the famous Spitfire wings. The Company is now the largest private Mint in Europe."